My sister-in-law brought a delicious strawberry cake to a family picnic at my house a few weekends ago. The cake was a hit with everyone because it was moist and packed with fresh strawberry flavor. Of course, I asked for the recipe. It was a Paula Dean strawberry cake recipe that started with a white cake mix. I wanted to make cupcakes from the recipe so I went into test kitchen mode. If you decide to make this using Paula Dean's recipe be sure to read the full recipe through to the end. I know, that's rule number one of baking, but once in a while some of us break the rules. If you don't read the recipe through to the end you'll most likely end up with a very soupy frosting. I may, or may not, know this from personal experience. Through my test kitchen experience, I made a few changes to the original recipe. I thought the recipe ingredients unnecessarily added too much sugar. 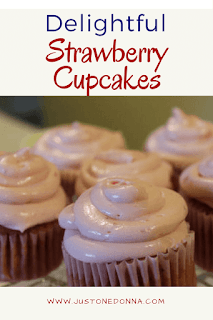 To adjust for this I used frozen, unsweetened strawberries and sugar-free strawberry gelatin in the cupcake batter. Then, I cut the amount of confectioner's sugar in the frosting in half. My local grocery store did not have any strawberry extract in stock so I substituted with a Dunkin Hines Frosting Flavor Enhancer. The strawberry shortcake flavor enhancer worked perfectly because it added a flavor punch without adding liquid to the frosting. There is one challenge with these cupcakes. The cupcakes looked perfect when I took them out of the oven, but they quickly deflated as they cooled. Extending the cooking time had no effect. They still deflated, resulting in a moist and dense cupcake. 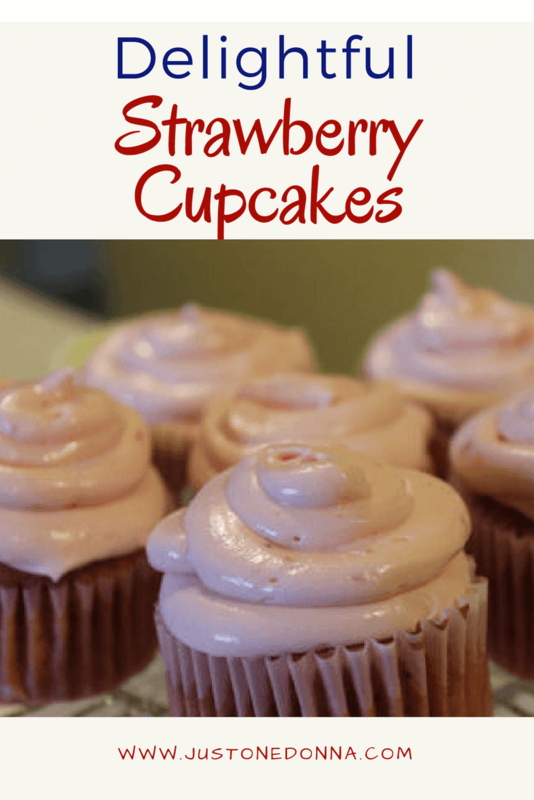 The strawberry flavor is delicious and the cupcakes keep well in the refrigerator. In a large bowl, combine the cake mix, gelatin, eggs, oil, water, and strawberries. Using an electric mixer, beat until smooth, about 2 minutes. Using a scoop, fill muffin tins lined with papers, and bake on the center rack of your oven for 24 minutes, or until a toothpick inserted in the center of the cupcakes comes out clean. Cool completely before frosting. To make the frosting, mix the butter, cream cheese, frosting flavor enhancer and pureed strawberries together until smooth. Add the confectioner's sugar, one cup at a time, beating until smooth. Pipe with a decorative tip onto your cupcakes. Before you go....Never miss a Just One Donna post by signing up to receive posts in your email or your favorite RSS feed. Links are in the sidebar. I love Strawberry anything and a cake or cupcakes would be right up my alley, thanks for posting! I think you'll like this one. It is yummy. Strawberry cake/cupcakes are my absolute favorite! I usually make the cake from the box (I'm clearly not a baker), but maybe I'll try this the next time I have to bake for the office. Of course, my hubby will have to sample them first so I won't embarrass myself!